Contemporary luxury meets classic sophistication at this iconic hotel, just steps from an exceptional Fifth Avenue shopping experience. Debuting a fresh, refined approach to modern elegance, The St. Regis New York exists beyond expectation.Dine and entertain at the King Cole Bar, pause for a moment in the Cognac Room, work out in the athletic club, or host a gathering in one of our 16 perfectly appointed function rooms. St. Regis Butler Service ensures that preferences are known.All 171 guest rooms and 67 suites have been completely remodeled. Original design elements such as crystal chandeliers and elegant crown moldings have been married with modern artwork, vibrant-hued fabrics, and glamorous beveled mirrors. 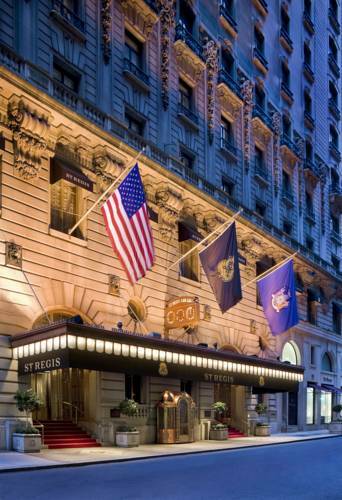 Located in the heart of midtown Manhattan, The St. Regis New York is within walking distance of Central Park, Fifth Avenue shopping, excellent restaurants and exciting theater. Astor Court's menu masterfully combines the freshest seasonal ingredients locally sourced from nearby farms. Traditional favorites have been updated and incorporate diverse spices and flavors that reflect the city's cultural mixture. Enjoy an aperitif in this legendary society club where the Bloody Mary here known as Red Snapper first landed in America and was perfected. Maxfield Parrish s masterpiece King Cole mural keeps watch on hotel guests and knowledgeable New Yorkers.